Over the last decade I have spent a lot of time thinking about how to improve how we communicate our research to diverse publics, and get beyond the same old social bubles and filters. This article by the Guardian discusses which is better—climate hope or climate fear? 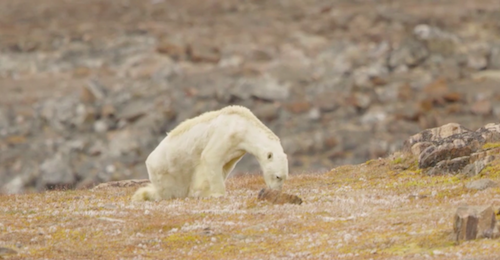 I know that the picture of the starving polar bear broke my heart whether or not it is from illnesses or climate change, it was effective, but did it increase your agency to act? So, I am re-posting the picture of the polar bear and offering a solution. The most effective action an individual can take to reduce your GHG consumption is to reduce your meat consumption to twice a week or become a vegetarian. And as an adult, you have the added health co-benefits. Watch our video, To Meat or not to Meat?, below to learn more. This CBC news article talks about another policy option. One of the objectives of our new research project is how to integrate contemporary museum curatorial practices and social media to accelerate research impacts to Canadian decision-makers. I strongly strongly believe that just as it is always better to come from love than from your pain, it is more empowering to act from both hope and fear. So, we try whenever we communicate to highlight the many innovations and solutions there are available to everyone. It all begins with one small step every day, all year long.